1) A quiet grocery store in rural Colorado. (I drew a map of the inside of it for you in Paint, which is surprisingly tricky. Nonetheless, if you ever found yourself in this grocery store, this extremely accurate map would help you find at least four things.) 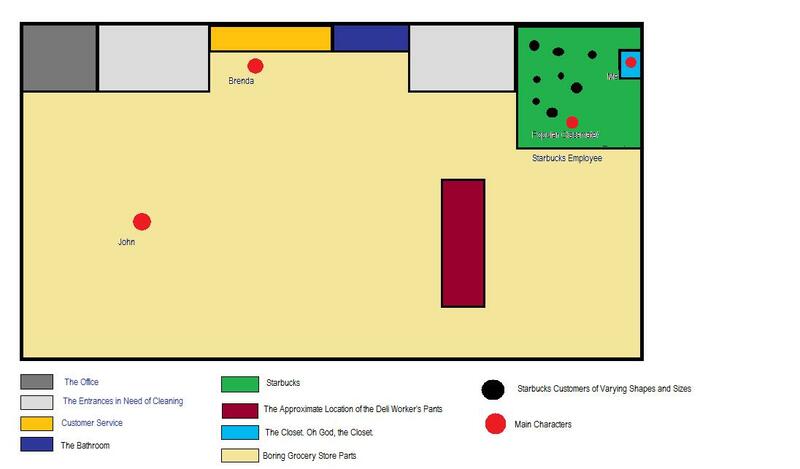 Imagine a peaceful setting: seven or eight customers are in line in the Starbucks located in the store, the evening manager chats with the customer service representative at the front desk. Around you are calm grocery store sounds: the periodic beeping of items getting scanned, customers cursing the checkers, and food slowly going bad. So I’m no cartographer. You’ll have to double-click to make it big enough to read. 2) A closet, relatively normal looking, inside the Starbucks. There’s a small faucet and basin in the wall in the lower third of the closet with a hose attached to it. The closet is used to hold cleaning supplies, safety vests for baggers to wear when getting the carts, and raincoats and parkas emblazoned with the store name and logo. 3) A high school-aged Stephanie, diligently bagging items, collecting carts from the lot, and cleaning up watermelons that have mysteriously exploded in the produce department. High school-aged Stephanie looks a lot like contemporary Stephanie, except blond and with better vision. I will use literally any excuse to get this picture onto this blog. 4) The most beautiful mullet you’ve ever seen. It’s not long, or even very full, but it’s situated on the head of one of the nicest ladies west of the Mississippi. She is Brenda, the Assistant Manager and she is awesome. 5) A relatively popular high school classmate of Stephanie’s is working in Starbucks, making drinks. It’s a far more glamorous job than cleaning up watermelon guts. 1) Brenda called me over to the customer service desk to ask me to clean the carpets in the front entrances using a Rug Doctor. I’ve used a Rug Doctor once or twice in my day, so I told her no problem. I said, Brenda, those carpets will be so clean when I get through, you could open your recently-purchased groceries and make a sandwich on them. 2) After I’d puzzled over getting the tank of the Rug Doctor to a sink, another manager named John pointed out that I’d need to use the faucet in the closet in Starbucks, because it was attached to a hose. John was part of the National Guard and full of common sense. Feeling sheepish, I pulled the machine through the storefront and into Starbucks. I had to walk through the line of people waiting for drinks to get to the closet, so each of the customers witnessed me take the vacuum across the store, walk into the closet, and shut the door behind me. 1) Vowing to be more practical, I moved everything in the closet away from the floor, so that nothing got wet in case I got a little careless with the hose. I triple-checked to make sure the hose was connected to the faucet, I put the end of it inside the tank at the back of the machine, and I turned the handle. 3) I turned the handle some more. 5) I spun the handle. 6) There was still no water, except for some light spitting through the end of the hose. 7) I cranked the handle and suddenly it was in my hand, a foot away from the faucet, and a fountain of water was gushing from where the handle should have been. When I say gushing, I mean GUSHING. It was pouring out, straight into the air, hitting the top of the closet so hard that a ceiling tile was knocked loose. I didn’t want to alarm any customers in Starbucks, so I didn’t yelp or scream or anything. I calmly tried to shove the handle back on the top of the faucet, but the water pressure was too much and it my hand kept slipping. 8 ) At this point, most of my sleeve was soaking wet. I wrestled the handle on my own for the next few minutes, but it was like a Three Stooges movie in there. I was attempting to screw the handle back into the top of the faucet, but the water wouldn’t let me get that close, so I pressed my hand over the faucet to decrease the pressure and get the handle on there a little bit at a time, but it didn’t work either. Like this, but with one girl and a lot of water. 9) I kept periodically peeking around the door with a smile on my face to see if anyone was looking at the closet. The third time I looked out, my hair and face were quite wet and my makeup was pouring down my face. People were starting to notice and I was losing my reassuring smile. Luckily, most of Starbucks was still happily oblivious. I finally got the handle partially screwed on, and the water slowed down, but because my life is a slapstick movie, I looked down at it and the water picked back up. The handle flew off and hit me in the face. 10) There was maybe half-an-inch of water in the bottom of the closet at this point and it was starting to creep out under the door. Water was spouting out, hitting the ceiling then raining back down onto me, onto the coats, into my shoes, and into the pocket of my apron. (Yeah, I had an apron. What of it? It was fantastic for storing things.) The faucet handle was gone- I couldn’t see where it fell in the downpour with mascara in my eyes- so I kneeled down and crawled around on my hands and knees feeling for it with my hands. My pants were soaking, my shirt was soaking, and my apron dragged through what was quickly becoming a full inch of water. “Yeah!” I shouted over the indoor rainstorm. “I’m just filling this Rug Doctor.” It wasn’t actually a lie, because at this point the Rug Doctor was nearly full of water. It’s just that the rest of the closet was too. “Deal!” I shouted, with my mouth against the door. 12) I gave up on finding the faucet handle and stood, covering the faucet with my hand, which only resulted in the water spraying everywhere. I grabbed around for one of the raincoats, and I found one under a sopping wet parka that suddenly weighed 20 pounds. I put it halfway on with one hand, then quickly switched my hands on the faucet and finished getting the coat on. (I was already soaking wet. I’m not sure why I thought putting on a coat would be a good idea at the time. Maybe it was years of conditioning by my parents.) I pulled the hood up over my head and looked around again. There were now two inches of water on the bottom of the closet. 13) I peeked my head around the door of the closet one more time. Someone in Starbucks gasped and someone else said, “Why is it raining?” I looked at my classmate through my flood of makeup and said, “Maybe now you should call for help.” “Right,” she says, and stared at me while she phoned Brenda, who up to this point had been sitting at customer service happily oblivious to the carnage in Starbucks. 14) I’ll never know what she said on the phone, but Brenda ran in and whipped open the closet to reveal me, standing there, soaking wet in a raincoat, finger in the faucet like the Little Dutch Boy. I didn’t even have to say anything. She ran to the intercom and ordered John to Starbucks. I started to fervently hope he had enough muscle to push the handle onto the faucet… then remembered I couldn’t find the handle. 15) I pulled my finger out, the water started gushing to the ceiling again, people were screaming, and I slipped and fell in my rush to find the missing piece, which was submerged in a corner. I’d just wrapped my fingers around it when Brenda grabbed my calf to pull me out– John had arrived. He took one look at the situation and took his shirt off like Superman in the phone booth, which is an image that is permanently burned into my brain. He took the handle from me and dove in. In less than a minute, he had the handle screwed back on and everything in place. 1) The closet was dripping, the coats were mushy, and I looked like I fell in a lake. Brenda looked mad. John looked mad. My classmate looked mad. The customers looked confused. 2) Brenda ordered me to the office to get a dry shirt, so I had to squish across the front of the store, refusing to make eye contact or answer questions. She also made me to take off all my wet clothes so she could hang them to dry in the bathroom. This meant that all night, customers kept approaching us to say someone seemed to have forgotten their shirt and bra in the restroom. One customer brought my bra OUT of the bathroom to complain about it. 3) Brenda gave me some dark sweatpants that someone in the deli volunteered after hearing my story and lent me her Mickey Mouse jean jacket. 4) I still had to clean the rugs. I AM GOING TO BE LAUGHING ALL NIGHT. :) I AM HAPPY YOU SURVIVED. That makes two of us. Thanks for mentioning me on your blog! I’m very jealous of your funniness. If it makes you feel any better, I’m pretty short and I have weird hair. If I’m glad this happened to you, because later you could write this hilarious post, does that make me a bad person or a supportive person? I was laughing while still reading the map! Love how you weave a tale! Keep it up and someday you will make it big. No more carpets and Rug Doctors for you! Meanwhile, keep on with your humor and your joy! Thank you! I look forward to a potentially Rug Doctor-free future. I haven’t been able to look at one since, and now I have this weird anti-carpet hangup. Haha. Funniest post I’ve read in forever. Oh, and I’m really sorry you nearly drowned in the supply closet! Ha. Thank you for your concern (and also for laughing at my near-death experience). Living through watery hell is very funny the way you tell it. I am glad I wasn’t in that closet though. Me too. If you’d been in there too I think one of my flailing limbs would have popped you in the face and then I would have felt REALLY guilty. Ha. I’ll start on my next duty shift, when I have hours at the desk and nothing to do. I’ll dedicate it to you, and then you can read it when YOU have hours at the desk and nothing to do. Oh my gosh. That was the funniest thing I’ve read in a long time. I cried. That might be the best snippet I’ve read in awhile. Though I have suspicions that your manager might not have been as awesome as you remember. Why didn’t she just send you home to change into dry clothes? This is one of the most brilliant things I’ve ever read.